Non refundable unless workshop is cancelled. Balance due by April 18, 2019. Balance due if deposit has been paid. Due by April 18, 2018. Not refundable after April 18 unless workshop is cancelled. Fee when paid in total without prior deposit payment. $245 is refundable up to April 18, 2019. 100% refundable if workshop is cancelled. Oil, Pastel, and Acrylic mediums welcome. and clicking the "Check Out" button. Participants will receive access to Mike's Aesthetic Categories online instructional video to help them prepare for the workshop. The video explains and illustrates the 7 principles Mike utilizes in his painting. 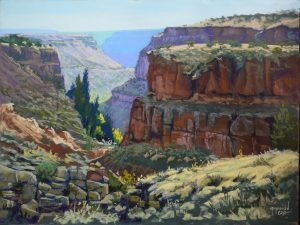 These principles take the artist through the entire painting process from start to finish and is the source of Mike's highly acclaimed painting and teaching success. Following the demonstration, Mike will supply each student the same photo reference he used. Mike will then lead everyone in his step-by-step painting process. He has found that this is the fastest and most effective way to build confidence while learning his painting method. In addition to paint-alongs, students will work from their own reference photos. In addition to Mike's personal instruction, videos of Mike's demonstration will be made available at no charge to those interested in re-living and reviewing the learning experience received, for years to come. 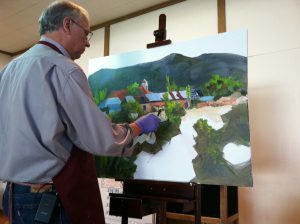 Click here to view Mike's time-lapse video of a landscape painting demonstration. 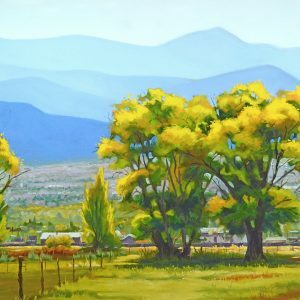 This demonstration video compresses a 2 hour demonstration by Mike to only 9 minutes, but it includes much of Mike's audio commentary explaining his painting process, along with helpful painting tips. You may view the video as often as you like. "Success is where preparation meets opportunity." “...You are one of the hardest working artists I've ever known, bar none. 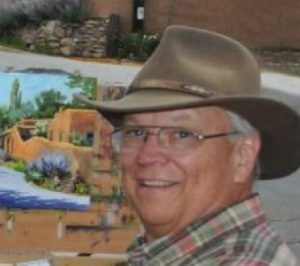 For more than 40 years, Mike Mahon has captured the essence of the Texas, New Mexico and Santa Fe areas through his landscape paintings and portraits. His works focus on the unusual and off-the-path scenes, catching slice-of-life vignettes in bright and vibrant colors in his impressionist style pastel and oil paintings.